Once you are familiar with a good CMS and common coding concepts, switching from developing in one CMS to another is fairly straight forward as the process for things tends to be similar. For instance, creating a Drupal sub-theme is conceptually the same as a creating WordPress child theme. You need a file that defines the theme, and what the base (parent) is. To make changes to the theme you add files to override the parent files. Creating Drupal sub-theme is quite simple. The documentation page “Creating a sub-theme” at http://drupal.org/node/225125 outlines what is needed. One thing I really like about Drupal sub-themes as compared to WordPress child themes is that Drupal sup-themes have no limit to chaining, you can make sub-themes of sub-themes and so on. WordPress only supports 1 layer of child-theme. This is a issue if you want to make a customized version of a theme that is a child theme of a framework, which is a common configuration for commercial themes. 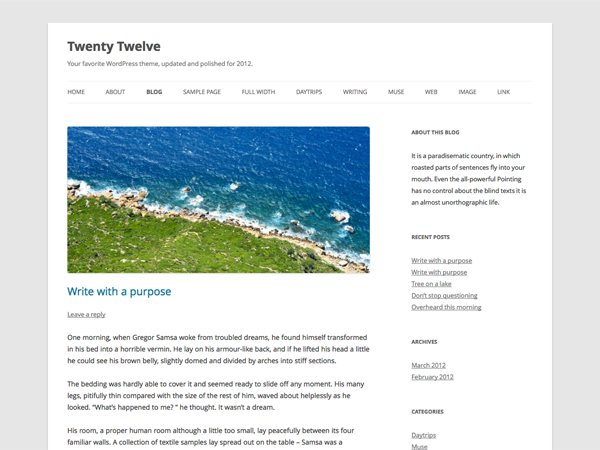 WordPress will be getting a new theme with version 3.5, the long awaited TwentyTwelve (which was supposed to ship in 3.4, but was not quite ready). Since it was almost ready for 3.4, it has been available for several months now if you knew where to find it. I’ve already built client site using it as a parent for a custom child theme. It’s a great theme to use as a parent since it is so plain, there is not a lot that you need to undo before you make it the way you need for the child theme. Also, as the newest official WordPress theme it will also be supported for a while. It is a lot easier to work with TwentyTwelve than it was with TwentyEleven, which I never actually used as I didn’t like some of it’s features. I stuck with TwentyTen until now. One thing that is not so great about TwentyTwelve out of the box is it does not support IE8 and below very well. IE8 is still quite high in the analytics numbers I’m seeing on the sites I support so I can’t justify dropping support for it yet, even though it’s rumoured that some of the biggies like Google will be in the next couple of months.